The Teen Council got together Monday to play Wiffle Ball. It was rather hot that day. What was it, mid 90’s? But they still had a lot of fun playing Wiffle Ball! The teens (and one teens brother) split into teams and the game was on! The games were played, the fudge pops were eaten, and everyone was still smiles at the end of the afternoon. You can see all the photos on facebook when you go to this link -> link. There are some pretty great photos on there! Join us next week, Monday August 1st at 3pm when we it will be Design Your Own Shirt (bring a shirt to work on!). A HUGE thank you to Coach Hunt who gave up his afternoon to play flag football with the Teen Council on Monday. There were some very disappointed kids who missed out on fooball and when they heard Coach Hunt was there, they were even more bummed out. It was a HOT afternoon but the teens stuck with it and enjoyed themselves greatly playing the game. It was made even more fun by getting to play on the football field at school! The library purchased the flag football kit (thanks to our amazing Summer Reading Program donations) and we will try to plan another game like this again. Worth repeating, we couldn’t have done this without Coach Hunt and we are ever so grateful to him! Join us next week Monday at 3pm for a Wiffle Ball game at the library. View all the photos Miss Alicia captured on this hot day with her phone over at our facebook page. March 26th, the teen council went to jail. To be more precise, they went to the old Jail Museum. But, yes, they did go to jail. The teen council, along with parents and a few siblings, visited the Old Jail Museum in Allegan. When the teens arrived to meet Mr. Scott Kykendall (known to the kids as Mr. K), he forewarned everyone that the tour could take nearly two hours. It lasted closer to three hours and everyone couldn’t believe that much time had passed. Mr. K never took a break from explaining interesting historical facts. To give you an idea how great of a time we had, Miss Denise and Mrs. VandenBerg ended up with 130 plus photos. You can view the entire album on facebook. Here is a direct link to the album (you should be able to see it even if you are not on facebook. However, you totally should be our friend on facebook to keep up with all our fun happenings!). Mr. K is one who has a talent for remembering all sorts of facts and pays attention to small details. All that and he held all our interest the ENTIRE tour. This many kids paying attention to history for this long on a sunny Saturday tells you how great of a tour this was. We could have easily posted many more photos than this. It was an amazing day of history at the museum and history truly seemed to come alive. Mr. K often would ask those of us on the tour “What do you think this person saw? What do you think it smelled like? What do you think he was thinking or feeling?” He truly worked to make the kids think about how this was not just some boring fact, this was REAL LIFE and it was LIVED by people right here in Allegan county. Mr. K went above and beyond to tell the tour of people that were from Martin. One of Martin’s most notorious bits of history is the life of Andrew Bee who noticed that Jefferson Davis was not a woman due to his shoe choice and called him on it so that Jefferson Davis was caught and the Civil War came to an end. We have more information on that story in the about tab of our blog. Please check out the website for the museum and make it a must do activity for your family. We ARE on Spring Break this week, it would be a great time to visit! Thank you to Scott Kykendall for a fabulous tour and thanks to our group who made it! It may not look like much right now, but it will soon! Welcome to March Book Madness! Every week you will have a chance to vote on your favorite book and see how it progresses through the brackets. It gets you thinking about the books you haven’t read and makes you nostalgic for the books you have read! Our center display is set up with all the books (that are in, these are popular books here at the library and hard to keep on the shelf) so you can easily check them out and enjoy them. The books paired against each other are totally random and have no rhyme nor reason. But in the end, the favorite books begin to emerge. These books are from your children and young adult section. It doesn’t mean that adults can’t get lost in these great stories as well! Stop in and vote for your favorite book every week and check out maybe a new favorite! Teen Council met on Monday’s LEAP DAY. How fun to do something fun on Leap Day. The teen’s discussed the book Can You Survive the Wilderness? by Matt Doeden. The teens basically surmised that they would EASILY survive. But that led to other conversations such as how snares are much harder than they look to make and what berries really are not poisonous and it ended up being a very interesting discussion! Miss Alicia and Miss Denise made Shamrock Shakes for everyone and while one batch was a bit heavy on the peppermint, the rest were delicious and we slurped them up greedily. Any day is a good day for Shamrock Shakes! We found recipe on Pinterest years ago but we wing it every year. The teens also discussed what they may like to do for a community service project this summer. The past two years they have volunteered at the school being teacher helpers for summer school kids. This year there will not be any summer school so the teens are looking for something to do other than just the Community Garden. They came up with some plans they sketched out and will be doing research on the projects for us to discuss at a next regular Teen Council meeting, which won’t be happening until April. 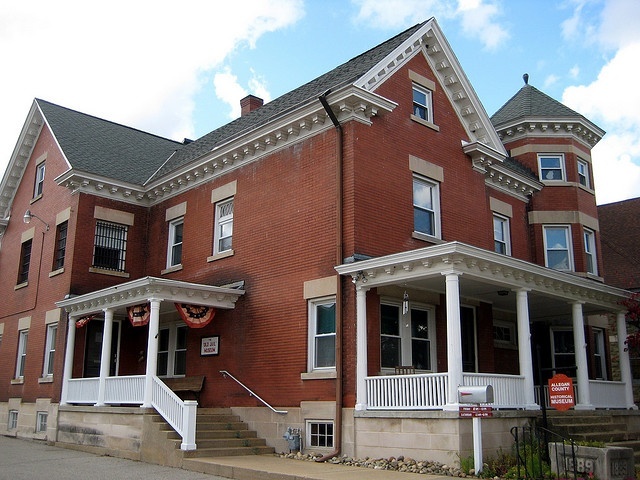 For March, the Teen Council will be visiting the Allegan Historical Jail Museum. There was some talk of hoping to throw certain siblings into the jail so I hope that they are prepared for our Teen Council. We are pretty sure that Scott K knows how to deal with them. We feel so lucky to have such a great Historical Expert in our town who is willing to take such an interest in our teens! Our visit will take place March 26th and the teens will be receiving an email with more information. After Teen Council there was some requests for a new book for the Teen Council to read. So, SURPRISE! There are books ordered and on their way. Alicia or Denise will be letting you know when they arrive. The next day after Teen Council’s Leap Day was a SNOW DAY so we are truly hoping that March is going go out as a Lamb since it has shown up so Lion-y today. Snow days are great days for Shamrock shakes so have fun making those on your Snow Day! We brag on our Teen Council quite often because they are easy to brag on. This weekend, one of our Teen Council Members Austin Marsman posted this on facebook and we felt it was so well written that we wanted to share it. Odyssey of the Mind teaches students to learn creative problem-solving methods while having fun in the process. The creative problem-solving process rewards thinking “outside of the box.” While conventional thinking has an important place in a well-rounded education, students need to learn how to think creatively and productively. At Martin Public Schools, on Saturday, February 27. WHAT TO EXPECT: Teams from all over the area (GR, Caledonia, Wayland,etc) will converge on Martin to compete. Each team will do a “Long Term” Performance (8 Minutes) and the performance is open to the public. The team will also do something called “Spontaneous”, Spontaneous is where 5 of the team members go into a room and are given a specific task/word problem to solve. Spontaneous is closed to the public and is judged based on creativity and teamwork. There will be food available for purchase in the Cafeteria. Parking: Both Elementary and High School Lots, as well as the Methodist Church for trailers and overflow. Problems: Each team has selected a problem for the season. Teams will build, ride on, and drive a no-cycle, recycling vehicle. It will pick up discarded items, adapt them in some way, and then deliver them to places to be re-used. The vehicle must travel without pedaling for propulsion. In addition, the driver will have an assistant worker riding on the vehicle that will help process the trash items being repurposed. They will make an unplanned stop along the way to perform a random act of kindness. Teams will design and operate a technical solution that simulates multiple styles of fishing. A Fisher Character will work from a designated area to “catch” three different objects that are outside of that area. The catch will be on the move and will include something expected, something unexpected, and a new discovery. The performance will also include a change of weather and a humorous character that portrays a potential catch and avoids being caught by the Fisher. Teams will create and present an original performance about a fable gone “viral.” The problem will include a list of fables attributed to Aesop. Teams will select one and portray it, and its moral, as going viral – that is, being shared throughout the community and beyond. The performance will be set in a past era and include a narrator character, an artistic representation of the fable’s moral, and a character that makes a wrong conclusion about the moral and is corrected. This problem requires teams to design, build, and test a structure, made only of balsa wood and glue that will balance and support as much weight as possible–twice. During weight-placement, teams can “Attack the Stack” where they will remove all of the weights except for the bottom one and the crusher board. Teams will also receive score for removing weights! After Attacking the Stack, the weight placement process can be repeated to add to the total weight held. Teams will incorporate weight-placement, repetition, and Attacking a Stack into the theme of the performance. The team’s problem is to create and present a humorous performance depicting problem solving from the perspective of three different animals. The animals will help a stranger, help each other, and solve a problem that threatens the survival of all animals. During the performance, the animals will sing and dance. They will also show curiosity, sympathy, frustration, and joy. Teams will create and present a humorous performance about an object that comes to life when touched by an item that turns out to be magical. While it is alive, the animated object will encounter three other objects that will result in a dramatic change of behavior. There will be a narrator character that explains what is happening and a character that becomes friends with the object. The performance will also include a team-created poem, song, or dance. We have quite a few of our Teen Council Members on the Odyssey of the Mind team and we are looking forward to cheering them on. Of course, we can only cheer them on AFTER the competition because you are required to be absolutely silent while they are performing. Great job, Austin. And good luck, Martin Teams!